SPRINT CAR STAR MATT MITCHELL COMING BACK TO RACING AT PERRIS AUTO SPEEDWAY! (Perris, CA, March 28, 2019) Perris Auto Speedway fans received some great news last week when promoter Don Kazarian announced that he had signed an unprecedented 20-year contract extension for racing at the famous Riverside County half-mile clay oval. This week fans are getting another dose of great news with the announcement that star driver Matt Mitchell will be returning to contest USAC/CRA races at The PAS. 2013 Matt Mitchell photo courtesy of Doug Allen. Mitchell, who will turn 32 in May, sold all his equipment in 2015 and has raced sprint cars sporadically for others ever since. He has devoted his time away from the track to his wife Lauren and their two young sons, Caysen 2 ½ and Baker who is 16-months-old. In addition, he has poured his time into his business, Pit Boss Jacks, which offers the highest quality jacks for various disciplines of racing. Fans remember the longtime Yorba Linda resident as a fast, hard-charging driver who wore a classy, pinstripe fire suit and who visited victory circle six times in USAC competition at The PAS. 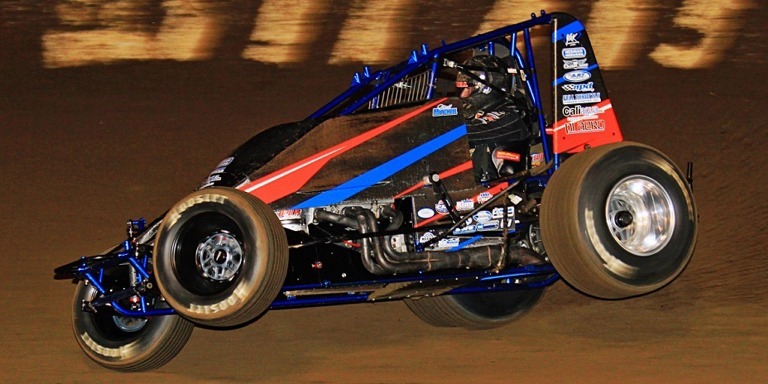 Included in those six wins were two triumphs in the prestigious “Salute to Indy.” Mitchell won the 2014 USAC West Coast Sprint Car Series championship and finished in the top 10 in USAC/CRA points every season from 2009 through 2015. Included in that run was third-place finishes in 2010, 2011 and 2014. Fans can again expect to see his beautiful blue #37 in the thick of the battle when it returns to the track starting Saturday night. The reason for not wanting to travel is desiring to spend quality time with the family. The dedicated dad said he only wants to race 12-15 times per year and not miss any of the boy’s “stuff” as they are growing up. Mitchell figures fans will see his vintage form when it comes to qualifying, but he does not expect to be 100% of his old self the first night. Mitchell is bringing back some familiar faces to be a part of the race night team including his father Nick, Mitch Johnson, Bobby Ferro and Cory & Jan Ballard. The Maxim chassis will be sponsored by Roy Miller Freight Lines, J.W. Mitchell Motorsports, Campbell Brothers Storage, Kaeding Performance, C.S.I., Sander Engineering and Don Ott Racing Engines.